April 2014: quick monthly weather summary from our weather station in Reigate, Surrey, UK. Another relatively dry month with 43.6mm of rain falling on Reigate, about the same as April 2013. Please note that we are still calibrating the automatic tipping bucket rain gauge which is possibly under-reading by around 10%. Calibration is a tricky affair and we want to get it right. We are supplementing all data by using monthly totals using our CoCoRahs manual rain gauge which is, by default, a more accurate measure of total rainfall. Raw data is available on our data page here. There were no dramatic warm-ups or cool-downs in temperature during the month. April 2013 saw a fairly significant warm-up from mid-month but April 2014 flat-lined with no especially warm or cold temps. It was noticeable that air temps never dipped below freezing. This allowed the average monthly temp to climb higher than April 2013 overall, despite a lower Tmax. A high pressure dominated the South of England for the middle of the month and reduced rainfall totals. Later in the month April showers delivered moderate rainfall totals. There were no significant thundery episodes. April is the month when many trees come into leaf in the UK. Below are the school lime trees in the playground taken at either end of the month. April is also a month of lengthening days and misty mornings with heat building at the surface triggering fluffy cumulus clouds in the afternoon. Some of these produce enough instability to produce “April showers” in cool maritime airstreams with warming at the surface. Excellent article here on the US tornado outbreak April 2014. In stark contrast, but related to extreme weather elsewhere, the drought in the SW of the USA continued through the month. 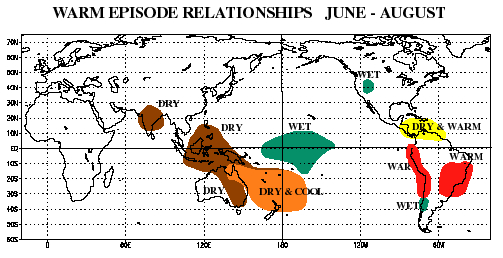 The map below shows the usual weather relationships expected during the course of a major El Nino event (ENSO). Note that the UK and Europe does not experience a known / correlated weather impact: i.e. an El Nino does not have a regular impact on our weather. However, this does not mean we will not experience some impacts from this major global weather gear change. All things considered, we are lucky in the UK to have less severe weather than many countries around the world, albeit this can be a little frustrating for weather enthusiasts who like a bit of exciting non-injurious weather occasionally!